Another picture from my amazing morning of photography amidst glorious winter frost in this western Canadian province (here’s a previous example: https://wp.me/p2ccTX-1fA). A telephoto lens was important to squeeze all the elements together and heighten the drama of this weather phenomenon. Adjusting the picture controls on my digital camera to “high contrast” also contributed to the drama. Look carefully in the background; that’s the front ranges of the Canadian Rockies shrouded in cloud. 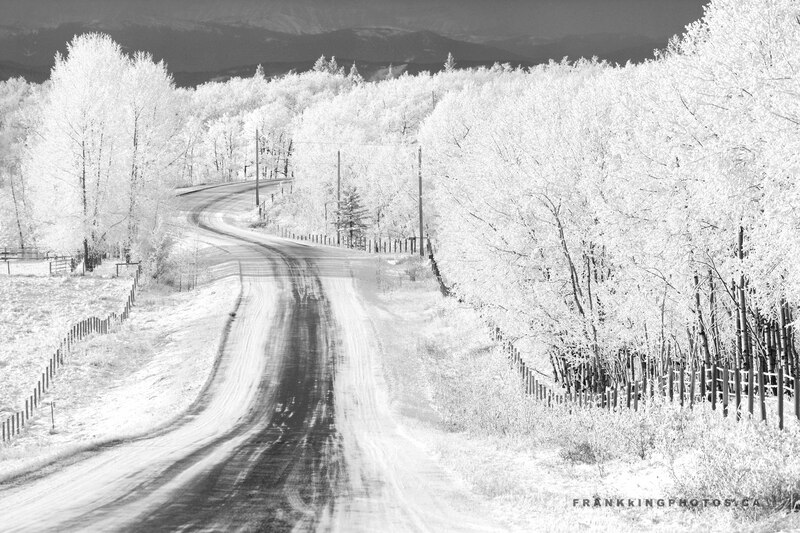 You can see this scene in colour here: http://bit.ly/FrostyAlbertaRoad. Nikon D7100, 70-300 mm. lens, tripod. Nice! I really like this one, a white forest!